Whether you’re a delivery service, landscaping company, or a moving company, businesses with a fleet of vehicles face an additional risk that businesses without fleets don’t have. When employees are regularly on the road, there needs to be standards of safety that every driver follows to ensure minimal accidents. Fleet driver training programs from Pacific Driver Education seek to help businesses who want to increase fleet safety on the road and to hopefully lower insurance costs. So, if you’re considering signing up for a driving safety program, here are a few of the most significant benefits. If you want to learn more about our program, get in touch with us today and we’ll be happy to answer any of your questions. Participating in a fleet safety program will give drivers the opportunity to learn which behaviors are putting them at risk the most, they will learn advanced driving techniques, and they will be able to observe other, more efficient drivers. A majority of drivers understand that they need to keep a safe following distance behind the vehicle in front of them, they shouldn’t use their phone while driving, and that they should come to a complete stop at a Stop sign. However, when so many drivers on the road haven’t actually been instructed how to drive by anyone other than their parents, there are a variety of things that even experienced drivers are unaware of. Fleet training courses will specify what should be done in a variety of situations, including bad weather and what to do around irresponsible drivers. These external factors will help drivers become more aware of their surroundings and will give them the tools to react in a safe and efficient way in order to reduce risk on the road. Vehicle Maintenance: With proper training, a driver will better understand how to drive efficiently in order to save fuel and reduce wear and tear on the vehicle. Insurance Costs: With an understanding of how to safely drive a vehicle, there will be fewer accidents, which can help lower insurance premiums. Medical Costs: When your employee gets in an accident, it’s the employer who has to pay for hospital costs. When successfully completed, a fleet driver training course could potentially pay for itself down the road. If your business needs to be DOT compliant, fleet training courses can help. Along with helping drivers remain safe on the road, you can receive all of the necessary certifications that show your business is following the correct processes and procedures. The fleet driver training program offered by Pacific Driver Education lets your business create your own course, including seminars and on-the-road training. Our staff have more than 25 years of experience working with fleet drivers and we understand what it takes for various industries to see success. We work with all types of drivers and we try to make it as comfortable as possible by using company vehicles. 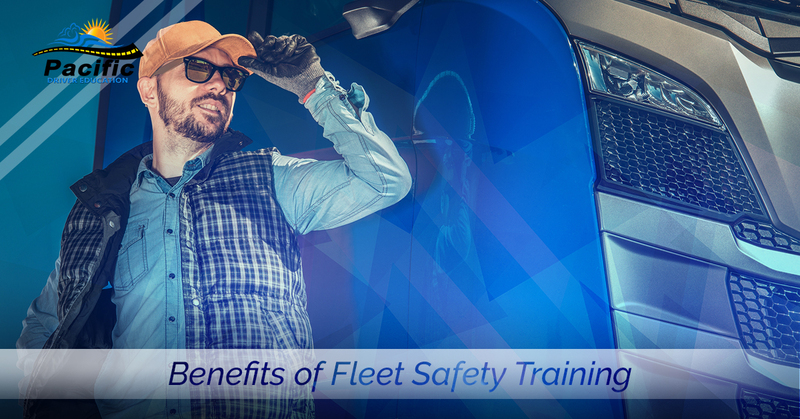 We know that you have a business to run, but we also know that drivers everywhere need specialized training to improve the safety of their fleet. If you have any questions or want to learn more about our programs, get in touch with us today!